Annual No-Tsu-Oh Parade through downtown Houston. Courtesy of the Houston Chronicle. Image available on the Internet and included in accordance with Title 17 U.S.C. Section 107. 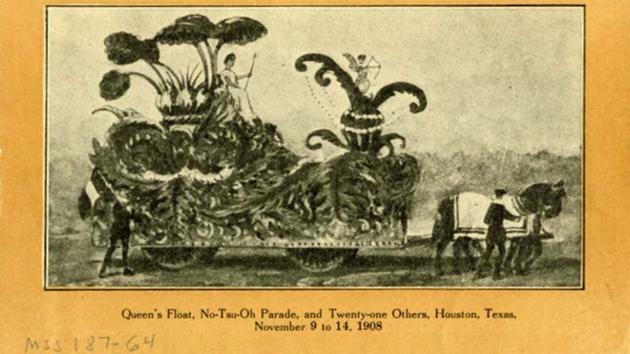 The Queen's Float from the 1908 No-Tsu-Oh Parade. Courtesy of ABC News. Image available on the Internet and included in accordance with Title 17 U.S.C. Section 107. 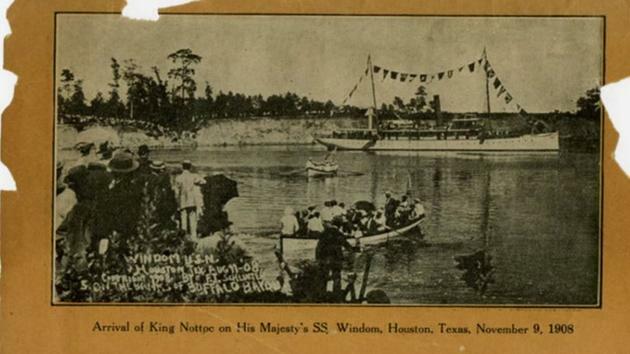 Festival-goers watch King Nottoc arrive on Buffalo Bayou for the 1908 No-Tsu-Oh festivitiesl. Courtesy of ABC News. Image available on the Internet and included in accordance with Title 17 U.S.C. Section 107. NO-TSU-OH. No-Tsu-Oh, a carnival patterned after the New Orleans Mardi Gras, was celebrated annually in Houston from 1899 until World War I. 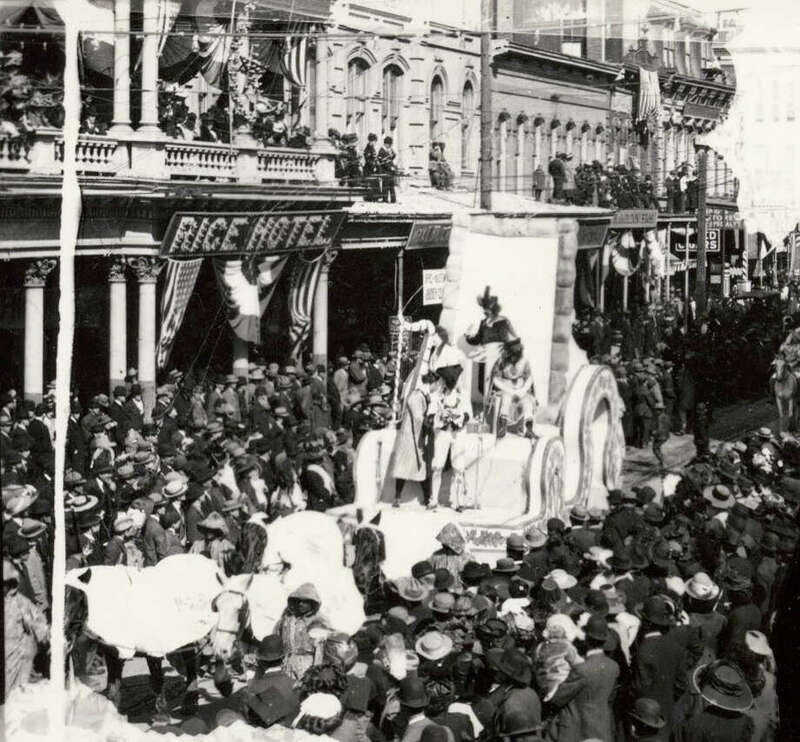 The festival, designed to stimulate commerce by bringing people to the city, customarily filled a week in November and featured parades, balls, and a football game between the University of Texas and the Agricultural and Mechanical College of Texas (now Texas A&M University). The carnival was characterized by much backward spelling. No-Tsu-Oh, for example, is Houston spelled backward; black citizens celebrated the De-Ro-Loc (colored) Carnival; and King Nottoc (cotton) reigned over the early festivals until King Retaw (water) replaced him to celebrate completion in 1914 of the deep-water channel to Houston (see HOUSTON SHIP CHANNEL). Traditionally, a prominent local businessman reigned as king, and the most blue-blooded debutante of the season as queen. Among the kings were John Henry Kirby, Jesse H. Jones, and William T. Carter. The queens included Frankie Carter (see RANDOLPH, FRANKIE CARTER), who became a liberal Democrat leader in the state. The carnival was suspended with the advent of World War I and was never revived. Charles Orson Cook, ed., "John Milsaps's Houston: 1910," Houston Review 1 (Spring 1979). Handbook of Texas Online, Marilyn M. Sibley, "NO-TSU-OH," accessed April 19, 2019, http://www.tshaonline.org/handbook/online/articles/lln01. Uploaded on June 15, 2010. Modified on June 27, 2017. Published by the Texas State Historical Association.